DATES AVAILABLE 1ST, 6TH, 7TH, 8TH, 14TH, 15TH, 20TH, Join us at one of our fantastic Christmas party nights in our fully dressed marquee. 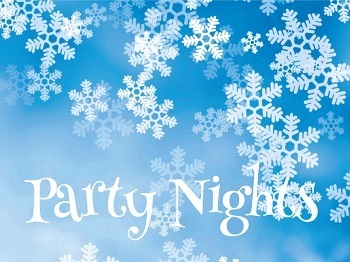 Start the night off with a glass of bubbly then indulge in a superb 3 course meal followed by tea, coffee & mince pies. Then it’s time to dance the night away with our resident DJ. Parties of 12 will be seated at their own table. Couples or groups of less than 12 will be seated at a shared table. Our party nights are truly a night to remember and with all nights being fully booked in 2017. Therefore we recommend you book early to avoid disappointment. Doors open 7pm Dinner served 7.30pm.